The M4/M5 links Exeter directly to London, the Midlands, South Wales and the North including Scotland. The average journey time from either London or the Midlands is 3 hours. Download our detailed directions to Streatham Campus by car. Please note that parking on the Streatham Campus is very limited. Satellite navigation: Use postcode EX4 4QJ. National Express coaches (08705 808080) call at Exeter Coach Station. The Coach Station is a short walk to the High Street where you can catch the local D bus which will take you to the Streatham Campus. Locally, the Streatham Campus is served by the D route. The D bus route includes Digby, St Luke’s Campus, the City Centre and Streatham Campus. Download the D Bus Timetable (PDF). Exeter has two railway stations – Exeter St David’s (main station) and Central. Exeter St David’s Station is approximately 10 minutes walk from the Streatham Campus and taxis are available. The average journey time from London Paddington is 2 hours 30 minutes to Exeter. See Streatham Campus map for the walking route. Use National Rail Enquiries to plan your route. For passenger information telephone 08457 484950. Direct flights operate into Exeter from Paris, Dublin, Amsterdam, Geneva and airports in the United Kingdom including Aberdeen, Belfast, Edinburgh, Glasgow, Guernsey, Jersey, Leeds/Bradford, Manchester, Newcastle, Norwich and St Marys. Further information is available from Exeter International Airport website. Coming from Outside the UK? Either (a) follow the signs for the Bristol Flyer bus (situated just outside arrivals). Tickets straight through to Exeter can be purchased at the Airport. The Bus will transport you to Bristol Temple Meads Rail Station (journey time is 20-30 minutes), from where you can take a train to Exeter St David’s train station (journey time approximately 1 hour). Or (b) take the Falcon coach service, an hourly and direct service operated by Stagecoach (with 19 journeys a day, 7 days a week). The fares are £13 one way, £15 for a return; tickets on megabus.com are bought as single journeys and start from as little as £1 (+50p booking fee). From Gatwick: travel via either Reading or Clapham Junction to Exeter St David’s train station. From Heathrow: either (a) take the Heathrow Express to London Paddington train station and then take the train from Paddington to Exeter St. David’s. Or (b) take the Rail air bus service from Heathrow to Reading train station and then take a train from there to Exeter St. David’s (book a through ticket at Heathrow Bus Station). 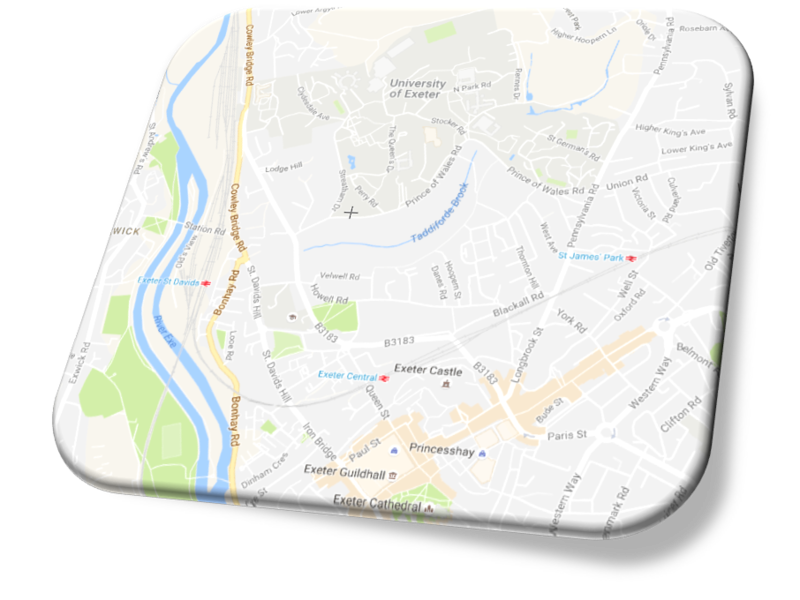 For general advice of how to get to the University of Exeter, see the University maps and directions pages.